On this date in 1475, the Louis de Luxembourg, Count of Saint-Pol was beheaded. The French King Louis XI “had need of a head such as his” because of Louis de Luxembourg’s part in the pompously self-styled League of the Public Weal. The “public weal” in question comprised civil war on behalf of feudal prerogatives that had slipped from aristocratic hands during the Hundred Years’ War. They were led by the ruthless Duke of Burgundy Charles the Bold. 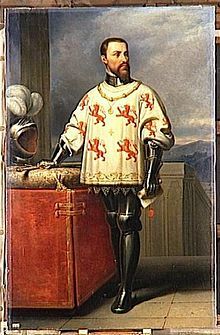 Louis de Luxembourg’s allegiance with Charles the Bold netted him, during the League’s successes, the title of Constable of France and the hand of the queen’s sister as inducements from Louis XI. But Saint-Pol was not the type to stay bought. Treacherously maneuvering between the Burgundian party, the royals, and the English (Luxembourg’s uncle sold Joan of Arc to the English, so they went way back) Louis eventually managed to irritate them all. He ultimately hatched a plan to assassinate Louis XI himself and fracture the French realm among a variety of great lords.